"I create viewer-interactive fused glass landscapes composed of clear sheet glass, glass paint, pulled glass stringers, and colored, crushed glass frits. My work is fired multiple times at different temperatures with layers and elements added at each step in the process to create a glass piece with depth and dimension. When complete, it is mounted on a mirror. Movement from the viewer animates the piece by shifting the three-dimensional relationship of the glass and its corresponding reflection in the mirror behind. The mirror behind the piece also provides an indirect source of light, which serves to subtly backlight the artwork. Learn more about Barb Beckman and her artwork at her website. Created in 1979, the Gallery in the Library hosts up to six exhibits per year, each typically spanning two months. As of June 2014, with additional space, a new look, and the Walker Display system, the Gallery in the Library is once again presenting lively and thought-provoking works of art to library visitors. The Gallery is now curated by the Art Advisory Committee: Public Information Manager Karen McBride, Community Engagement Librarian Sam Adams-Lanham, and Assistant Librarian Ivy Dally, along with Board of Trustees Liaison to the Gallery Barbara Pintozzi. 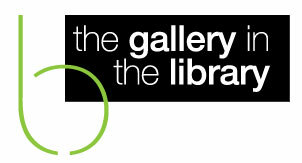 The Gallery in the Library is located throughout the first and second floors of the library and is open to the public seven days a week. Artists: interested in knowing the measurements of our exhibit walls? Internet Café (dark grey wall) 31' 6" 8' 6"
Base of Stair Tower (dark grey wall) 5' 5" 9' Although wall is wider, Walker System covers only 5' 5"
The Barrington Area Library's arts program expands the library's mission by stimulating imagination and fostering lifelong learning. The Committee's goal is to give local artists the opportunity to present new work in a public setting and encourages all artists in the Barrington area and surrounding communities to submit an application for consideration.